Invasive insects and diseases are threatening numerous tree species throughout the country. Impacts include tree mortality, destruction of forest and urban habitats, and other significant changes in forest ecosystems due to the decline or elimination of tree species. Many of these pests can be transported in inadequately-processed wood, including firewood and discarded wood debris left behind from tree care operations (Figure 1). Preventing the spread of these pests to new areas is critical for protecting valuable forest resources. Invasive forest pests of concern include those established in other parts of the country (e.g. emerald ash borer and Asian longhorned beetle), as well as those with limited distributions in California and other areas of the western U.S. (e.g. invasive shot hole borer, goldspotted oak borer, various bark beetle species, and the pathogens responsible for pitch canker and sudden oak death). Properly managing cut wood can effectively reduce the risk of spreading these threats to new areas. Arborists and tree care workers can help by using best management practices (BMPs) for cut wood. Some species, such as shot hole borers (Figure 2), can infest over a hundred tree species. They are intended to prevent the spread of a number of invasive pests. These pests are located in many different areas and their distributions are not definitively known. Incipient or outlier infestations may not be reported, making it less certain which areas may be free of invasive pests. It can be difficult to determine if a particular tree or wood cut from it is infested (or contaminated) with an invasive pest, including trees that appear healthy. Wood can become infested after it is cut from a tree. Even insects and pathogens that are native to a particular region of the U.S. can become serious pests when moved to an area where they don't exist. Goldspotted oak borer and pitch canker are good examples. The safest approach is to assume that all untreated wood can harbor invasive pests and therefore should not be moved from the local area. Utilize or dispose of untreated wood near the site where it was cut. 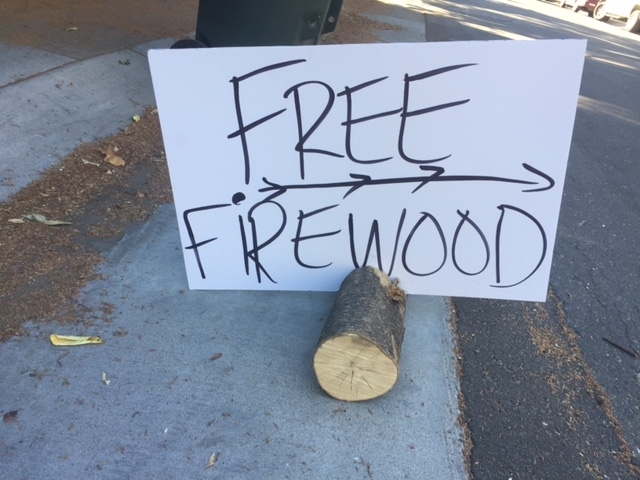 Firewood outreach campaigns like “Don't Move Firewood” and “Buy It Where You Burn It” encourage this approach. 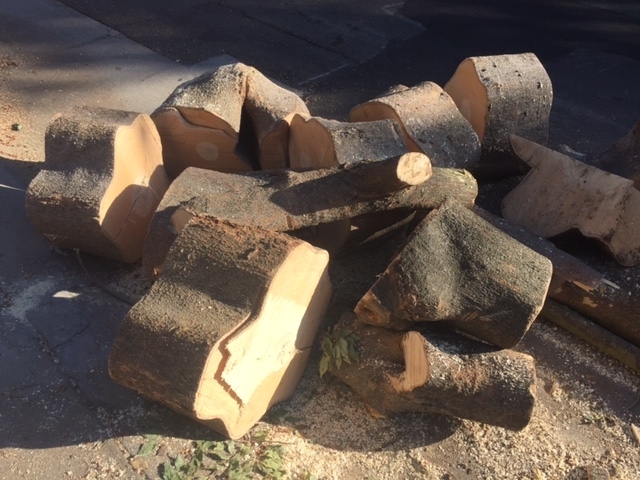 Untreated cut wood should not be left on the curbside for free pick-up (Figure 3) as there is no way to control where the wood is moved to. If wood is to be left with the landowner, talk to them about the danger of spreading invasive pests in infested wood. Handouts explaining the risk can be found at the California Firewood Task Force's website firewood.ca.gov/outreach.html and includes a Firewood Question and Answer Factsheet and Firewood Postcard. These can be printed and distributed to landowners. Grinding wood to a 1-inch minus chip size greatly reduces but does NOT eliminate all shot hole borers (SGB). Therefore, composting chips originating from near or within known SHB infestation areas is recommended. Wood should be chipped before being transported to a biomass or composting facility more than 50 miles away. If that is not possible, the receiving facility should promptly chip the material upon arrival. Heat treatment of infested firewood to a core temperature of 160° F for a minimum of 75 minutes has been shown to eliminate most insects and diseases. Complete removal of bark from branch and trunk rounds can eliminate certain insects that feed solely in or under the bark, such as bark beetles and some wood borers. Debarking does not eliminate insects that burrow in the wood or pathogens infecting the wood. Seasoning (drying) firewood on site for at least 2 years can reduce the risk of transporting most invasive insects. Similarly, wood that is cut from trees that have been dead for greater than 2 years is unlikely to contain living invasive insect pests, though invasive pathogens may still be present. Never treat firewood with an insecticide or pesticide. Doing so could result in exposure to toxic fumes when the wood is burned. 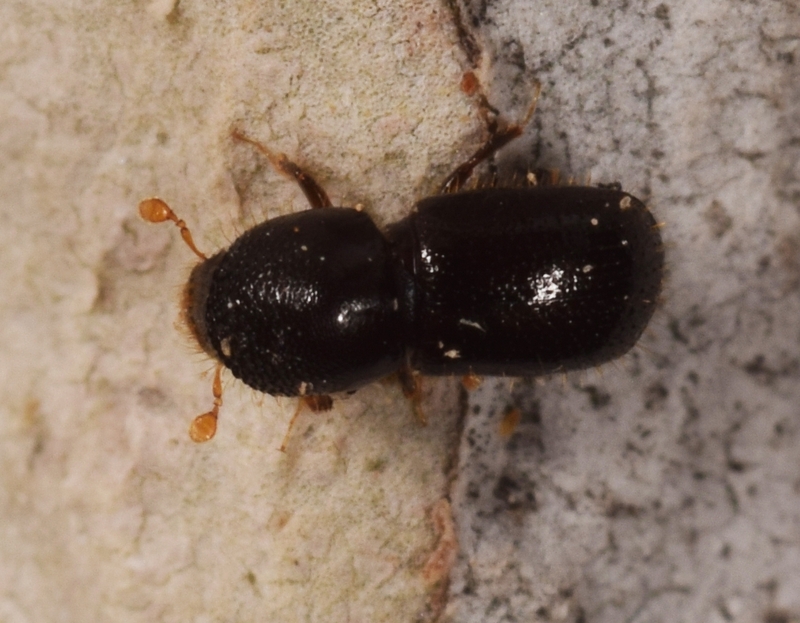 Invasive pests associated with firewood in the western U.S. The following insects and tree diseases are found in limited areas of the western United States and represent forest health threats to hardwood and conifer species throughout the nation. Compliance with federal and state regulations is required to move wood from quarantine areas. Adhering to BMPs will limit the spread of all invasive pests and help protect our urban and native forests. Invasive shot hole borers, Euwallacea spp. Ask about the firewood you are buying. Is it from a local source (less than 50 miles preferred) or has it been treated to eliminate or reduce pests (e.g. heat treated or seasoned for 2 or more years)? When purchasing firewood for camping, buy an amount that can be completely burned during your stay. If firewood is left over, leave it for the next camper; don't take if home with you. Plan on cutting firewood within 50 miles of where it will be used. Seasoning of green wood (letting it dry) for at least 2 years or using wood from trees that have been dead for at least two years can reduce the danger of transporting most invasive insects threatening trees. Note that cutting standing trees can be dangerous, especially dead trees which often are unstable. Only cut standing trees if you have the proper equipment and training to do it safely.